Samford University President Emeritus Thomas E. Corts was remembered as a person who made "a big difference in the world" and as a "deeply religious person" who practiced his religion in private during a memorial service Sunday, Feb. 8. The service in Samford's Wright Center honored the former University president who led Samford from 1983 until his retirement in 2006. Dr. Corts died suddenly of a heart attack Wednesday, Feb. 4. A crowd of more than 1,500 gathered for the service, which featured some of Corts' favorite hymns, scriptures and litanies, as well as words from people representing the spectrum of his life and career. 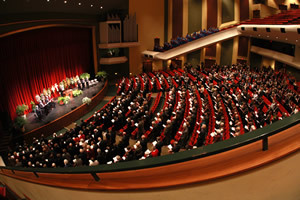 In the audience were state and federal government officials, including Alabama Governor Bob Riley, fellow university presidents and other educators, numerous Birmingham and Alabama business leaders, and Samford alumni, students and employees. "One of God's greatest gifts to us in this life is that we are permitted to participate in the doing of God's work upon earth," said Dr. Fisher Humphreys, retired former professor in Samford's Beeson Divinity School. "Clearly, Dr. Corts made a big difference in the world." Dr. Humphreys added that Corts' efforts to make Samford a Christian university "will endure forever in the lives of those who have been helped and blessed through the university." Samford research professor and retired former Provost William E. Hull described Corts as a person who read Scripture carefully, prayed earnestly and kept a journal faithfully to refresh the wellsprings of his spiritual vitality. "We live in a day when religion has become militantly aggressive, in your face, wear it on your sleeve so nobody can miss where you stand," said Dr. Hull. "But we gather here to honor a man who did just the opposite. He practiced his religion in private because he had learned from the Master that the secret of religion is that religion is secret. "This modesty never muted his witness, however, because he lived out his faith in everything he did." Even so, said Hull, "Corts was unafraid to challenge the status quo because his conscience was not captive to the latest poll." Retired pastor Roger Lovette noted that "one of the wonderful things (Corts) did was to establish the London Centre, hoping that students would learn to love England and the larger world that he loved." Lovette recalled that when the great English architect, Christopher Wren, died, someone said at his funeral, "If you would see his monuments, look around you." Lovette said the same might be said of Corts, but added, "I'm not talking about the buildings that bear his name," rather the people--friends, faculty, students and others--that he influenced. Lovette, Corts' former pastor in Georgetown, Ky., recalled being at Corts' inauguration as Samford president in 1983. "Nobody knew what would happen, but those of us who knew Tom Corts did know that whatever took place here would be good and fine and rich and rare. And we were not wrong." The Reverend Sarah Jackson Shelton, pastor of Birmingham's Baptist Church of the Covenant, related memories shared by Corts' three grown children. She had served as the Corts' youth minister when the family first moved to Birmingham. Son Christian recalled that his father had always been his hero. In fact, he said, when Tom Corts showed young Christian--then six--a newspaper article about a man who had plastic surgery so he could look like Elvis Presley, the younger Corts resolved to have surgery so he could resemble his father. Reciting a litany of his father's gifts, Corts added, "I could go on and on and never begin to articulate what he meant to me as a father." Daughters Jennifer Fuller and Rachel Wachter celebrated their father's love of words--their perfect measure and application. "Today we miss him even more because we find that we have no words to adequately express the deep love and admiration we feel for our father, nor do we have the words for the great sorrow we share,"
They recalled a line from poet Robert Browning, "Greet the unseen with a cheer," written above the door of their parents' home, and said, "for the rest of our days, Dad, in order to honor you, we will cherish the past, live the present to the fullest and greet the unseen with a cheer.'" As a reminder of Corts' love of gospel music, Samford's A Cappella Choir closed the service with the hymn, "It is Well." The music for the hymn was composed by 19th century songwriter Philip P. Bliss, about whom Corts had written.